Papa Stour, the ‘big island of the Priests’, is simply referred to as Papøy in 1299 (DN, i, no.89; Ballantyne and Smith, 1999, no.2; Crawford and Ballin Smith,1999, 49); it is first called Papa Sthora (ON stjóra = ‘large’) in 1452 (Ballantyne and Smith, 1999, no.22). It lies about a mile off the west side of Shetland and is a moderately-sized island, 2 miles in length, very indented with bays and voes. The dangerous sound between the island and Sandness is known as the Sound of Papa, the name first appearing on Blaeu’s map of 1654. (FIG.S1.2) Between Papa Stour and the Ve Skerries, some distance to the north west, is Papa-rof; ON rófa, narrow, shallow bank in the sea, is commonly used in Westside as a term for a fishing bank (Jakobsen 1936, 253). Papa Stour controls the southern entry to St. Magnus Bay, earlier St. Magnus Fjord, and has been tentatively identified by Crawford as the St. Magnus Island recorded in German and Dutch sources of the 17th century (Crawford 1999a, 13). Certainly, the location of Papa Stour ensured that it was ‘a very convenient fishing station’ in the eighteenth century (Low 1774, 123). The importance of this location on the west side of Shetland contributed to the importance of its role in the Norse period, on the route from Norway, via Shetland, to the rest of the Norse dominions stretching down the west coast of Scotland to the Irish Sea (Crawford 1984, 40). Its size meant that Papa Stour is named on all of the earlier maps (Blaeu 1654; Collins ?1693b; van Keulen 1727; Bruce 1745; Moll 1745b; Preston 1781; Depot Generale de la Marine 1803b; Arrowsmith 1807; Thomson 1827; Thomas 1838; Blachford 1846). The political significance of the island in the Norse period is suggested by the possible thing-place above the beach at Housa Voe; this is remembered in local tradition and survives today as a horseshoe-shaped circle of low stones (Low 1774, 123; Hibbert 1831, 125, 208-9; Crawford, 1984,48). The island’s status is reflected in the document of 1299, which refers to the ducal farm and suggests that the whole island was then in the possession of the kings of Norway. The royal official who was accused of financial malpractice, Thorvald Thoresson, was later called ‘dominus de Papay’ and had been granted the island probably for his main residence in Shetland (Crawford 1984, 48-50, 54; Crawford 1999b, 30; Crawford 2002; see below). Papa Stour is undulating with two hills rising to 60m and 87m on the south and west side and only the eastern third of the island is cultivated: ‘When the season is mild it produces very rich crops of bear, oats and potatoes.... in plentiful years it can afford a considerable supply to other parishes’ as was reported in the Statistical Account (OSA, 519). The Land Capability value which is given to the whole eastern third of the island of 52 (‘capable of use as improved grassland’) is really only generally applicable (and note that it is the same class as Eshaness). ‘The cultivated part, indeed, is a charming spot, abounding in Corn and Grass, the soil in general sandy. The uncultivated part thin and bare, scarce even affording pasture for sheep, and but little firing’ (Low 1774, 123). 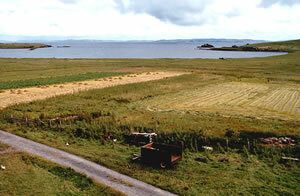 The cultivated areas fringe two bays, Housa Voe and Kirk Sand, with the principal settlement - the Biggings - lying midway between the two (Crawford 1999b, 25-9) (FIG.S1.1). Housa Voe, facing north, serves as the main landing place for the island, the name suggesting that it was nearest to the principal house. Kirk Sand faces south onto Papa Sound and is so-called from the location of the island’s church which lies immediately north of the bay and south of the Biggings. Although Muir thought the church to be modern, with ‘no appearance of an older foundation’ (1885, 74, 156), there is some evidence to suggest that this building does overlie a medieval predecessor (see below). Kirk Sand is one of the best landing places on Papa Stour, but the flatness of the bay ensures that a heavy sea can make it awkward to beach a boat safely (Peterson 1993, 70). Muckle and Little Skjibbie Geo, ‘ship cleft’, lie on its western side, close to Sneaans; Muckle Skjibbie Geo is now a noust site, while people would often be landed at the deep craigs at the Point o’ Skjibbie Geo until the pier at Housa Voe was built (ibid., 71; Crawford 1999b, 26). The supposed chapel site of Sneeans/Snøyans is on a slightly prominent headland between the west end of Kirk Sand and the bay of Tusselby to the south, about 300m from the present church. (FIG.S1.4). Sneeans is said in the OS Name Book to be ‘the site of a Romish chapel belonging to about the twelfth century’ lying amidst rough pasture (NB, Shetland, Book 21, 30). It is still called the ‘ald kirk’ by locals (info. from G.Peterson). There is a very interesting local tradition about this site (see Manson’s Guide to Shetland 3rd ed. 1933,p.182). It is said that the islanders first chose the Sneeans site for their church but that the building operations ‘were persistently interrupted by some supernatural agency’ and every morning the builders found that their work from the previous day had been destroyed. Then the corner stones were moved by the same mysterious forces to the present church site above Kirk Sand and the islanders accepted that that must be where they should build their church.37 This seemingly points to a persistent memory of a previous church at the Sneeans but also that the reason for the abandonment of that site and the move to the present site had been forgotten. It is rather strange that the two sites should be so close together on an island where there was only one scattald. At other places in Shetland (such as Fetlar see Papil, Site S7) the chapels relate to the different scattalds. Immediately below Sneaans is Kirk Gio, a cleft in the cliff, which may owe its name to the now buried chapel (Peterson, 1993,71). As part of the second phase of the ‘papar’ project survey and excavation were carried out at the Sneeans in order to establish what sort of chapel site was located there, if any. In theory it could have been a much older chapel site than the date of the building of the present kirk; built by the converted Norse community, or possibly earlier, from the days of the ‘papar’. The name of the bay to the south of the Sneeans headland- Thistleaby, Tusselby or Tisselby Sand - contains the ON element byr, (=‘farm’), the only example on the island. This may indicate that the original Norse settlement site on Papa Stour was closer to the shore here than the later farm at the Biggings (Crawford 1999b, 26-7). This bay, also known as South Sand, was once the base for the island mail boat, although it was not a safe landing place in all weather conditions and had to be periodically cleared of stone (Peterson 1993, 1-2). The only two nousts on Papa Sound, belonging to the crofts at Bragaster, lay at the South Sand (ibid., 2). Just to the south of the bay is another Kirk Gio, apparently marking the point beyond which the Glebe Croft could not gather seaweed (ibid.). 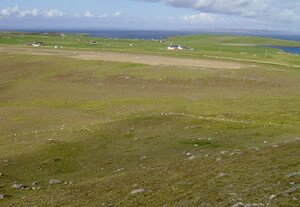 Two of a number of skerries lying off the east entrance to Housa Voe, these have important early remains and traditions associated with them. (FIG.S1.5). Brei (locally Breis) Holm, the larger of the two, lies closest to the coast of Papa Stour to which it was once joined for the remains of the arch are still pointed out (RCAHMS 1946, no. 1704; Lamb 1974, 89; Lamb 1976, 146-7, 151-2; Peterson 1993, 63; NMRS no. HU16SE2, SMR no. PRN 253). On its summit are located the turf-covered footings of eight sub-rectangular, sub-divided buildings, supposedly arranged in the form of a rough cross; the landward facing cliff is dominated by a wide, turf -covered bank (RCAHMS 1946, no. 1704; Lamb 1976, 147; Brady 2000c, 5; Brady 2002, 69). (FIG.S1.6). According to Peterson, local people used to refer vaguely to something buried there, hinting that the stack should be left alone (1993, 64). Recent excavation produced evidence, including sherds of Late Iron Age and Late Norse pottery, for at least two phases of occupation on the stack; beneath one of the three rectangular structures which were partially excavated, was a circular drystone structure (Brady 2000c, 21, 25; Brady 2002, 78-81). Other finds included unworked steatite, worked pumice, possible slag, vitrified fuel ash, what appeared to be crucible fragments and a large section of a saddle quern or stone bowl (ibid., 25). These have been taken by the excavator to indicate a self-supporting community which was making its own pottery and tools, as well as carrying out other industrial activities. Charcoal samples from the site have been recently C-14 dated to c.600 AD (Brady, 2004. ), which is a time when Christianity had possibly just reached Shetland, and Christian ‘papar’ may already have been associated in some way with the island . But at present it is difficult to categorise the excavations on Brei Holm into secular or ecclesiastical, and as the excavator says nothing recovered so far ‘can establish a link between this site and an ecclesiastical use’ (Brady,2002,81). Although he suggests that a monastic community still fits the model of settlement on such a site, we can be certain that it was not a stack site in the seventh century, and we cannot believe that a ‘monastic community’ which was carrying out some industrial activity would really choose to live in this exposed location-unless defensive requirements were also relevant. As Peterson suggests, the inhabitants of the island may once have fled to Breis Holm in time of danger (1993, 63). With the rich worth of her virginity. When the consequence of the Lady’s faux pas could no longer be concealed, Frau-a-stack became the scoff of the island, and was deserted by its fair and frail tenant. The house was soon afterwards unroofed and reduced to ruin, in contempt of the vow of chastity that had been broken’ (Hibbert 1822, 285, quoted in Lamb 1976, 151-2). This legend was first noted down by Monteith in the seventeenth century and repeated, with slight variations, by Low in 1774 (Low 1774, 122-3; Crawford 1984, 43; Peterson 1993, 62). The remains of a single drystone, bi-cameral structure, with overall dimensions of 8m x 7m, and built from imported sandstone, can be seen on the summit of the stack (Sinclair, 1797/1978, 524; Lamb 1976, 147; Brady 2000c, 5; Brady 2002, 69, 74; NMRS no. HU16SE3, SMR no. PRN 254). Lamb discusses this and Brei Holm as examples of his possible ‘paired-stack’ settlement sites (Lamb, 1976, 149). Once more the evident erosion of the coastal cliff features around Papa Stour defeats any attempt to derive a rational explanation from these surviving structures. They merely tell us that such dominant, easily-defended locations were of interest and use to previous inhabitants, both late Iron Age and Norse. ‘To come at the proper landing place, it is usual for boats to go round the east side of the island ; and, to cut this shorter, they go thro’ a vast cavern, cut thro’ a small holm, into which a boat can go with all her oars out. This is the common passage, but it is rather horrible. ... Hard by the opening of this cavern is Frau-a Stack, or the Lady’s Rock, a steep insulated rock ...’ (Low 1774, 122). Although the medieval dedications of Walls and Sandness churches are known (Paul and Margaret), Papa Stour’s dedication has never been recorded although it has been surmised from place-name evidence that it may have been Magnus (Crawford, 1984, 1999, 130; FES, Vol. VII, 317). A now lost Pictish symbol stone, built into the wall of St. Margaret’s church in Sandness, was drawn by Low in 1774 (1774, 121; Fisher 2002, 54) (FIG.S1.8). Low recounts that the stone was held in superstitious regard by local people, but that he could not discover the reason for this or the meaning behind the symbols (Low 1774, 121). Unfortunately no early Christian stones have survived on Papa Stour. In the medieval period, Papa Stour had its own parish priest, (whose ministrations perhaps extended to cover Foula and Sandness according to Cant 1976, 18). ‘Svein the Priest’ is mentioned in 1299, apparently on Papa Stour ( DN ,i, 1, quoted in Jakobsen 1936, 172; REO, 13; OSR, i, 38-9; Ballantyne and Smith, 1999, no.2), while Sigvald Halfdanson was ‘church priest’ on Papa Stour in 1355 and acting on behalf of Fru Herdis, heiress to Thorvald Thorvaldsson in 1360 (Ballantyne and Smith, 1999, nos.9 and 11). Sir Jon Knutson, Fru Herdis’ priest, presumably domestic chaplain, was present at one of these transactions in 1355 ( Ballantyne and Smith, 1999, no.9). The parish church in this period is more likely to have been on the site of the present church rather than at Sneaans (ibid., 18, n. 42; NMRS no. HU16SE50, SMR no. PRN 1833, HU 1771 6003). The parish of Papa Stour was united with Foula, Sandness and Walls in the sixteenth century (Sibbald 1711, 30); at the time the Statistical Accounts were written each district had its own church, kirk session and poor’s fund (Elder 1841, 21). The bishop of Orkney possessed half the corn teind of the parsonage, the residual teinds being reserved to the vicar (Goudie 1910, 305; Cowan 1967, 5). Itinerant preachers appear to have officiated for part of the year in each area of the parish, at least during the early eighteenth century; however, by the end of that century, a single minister was having to rotate between all the churches, subject to the vagaries of the weather and his other duties (Thomson 1797, 110-111). According to the author of the NSA, this meant that Communion only took place once a year in each church, while services were held on Papa Stour once in every four weeks and occasionally more often in the summer (Elder 1841, 21; Foula was only visited once a year, although the minister stayed for two Sundays and preached often on the intervening days). A reader in each district, generally the schoolmaster, was supposed to make up any deficit in religious provision (ibid.). Although Papa Stour is very rich in prehistoric sites (Crawford and Ballin Smith, 1999, 24) there are no surviving structures from the early medieval period, nor have any pagan Norse graves ever been reported from the island. The ‘mutilated font’ said to be lying in a corner of the churchyard in the late 18th century could have come from any ecclesiastical site. 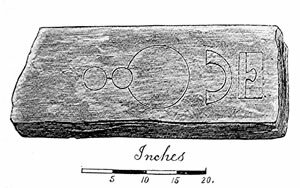 The Statistical Account also mentions what was believed to be an old anchor stone which had lain ‘time immemorial’ in the churchyard and which had recently been built into one of the corners of the church itself,: it measured 8’ in length and 2’ in diameter, with grooves on both long sides.40 A copper basin engraved with religious symbols and ‘seemingly very ancient’, along with a bell and a silver cup, had been presented to the church by a Dutchman or ‘Bremener’41 (OSA, 533-4). At about the same time Low saw the possible anchor stone, suggesting that it might have been brought to the church as a votive present, but did not identify the concave stone seen by Brand and which may be the font noted in the Statistical Account (1774, 124; Brand ref?). There are various locations throughout Shetland supposedly connected with colonies of lepers in the 18th century who were isolated from the general population and survived-or died-in miserable huts, but the best-recorded are on Papa Stour (Crawford,1999b,42). The structures on Brei Holm were known locally as leper houses, (RCAHMS, no.1704) and local tradition indicated some in the centre of the island(Manson,1933, 180), but the best-known are on the north-facing slope of Hill of Feelie.42 (FIG.S1.9). It is a possibility that these sites are prehistoric and the hut foundations re-used for the lepers’ huts at a much later date, so as part of the second phase of the ‘papar’ project the area inside a walled enclosure on Hill of Feelie was surveyed in summer 2004. (see report by Ballin Smith, 2004). The enclosure measures c.60m x c.80m x c.64 m with the basal remains of a surrounding stone dyke, and gives the impression of being much older than the 18th century. There are two water sources, one shallow well surrounded by stone, and a stone-lined open cistern with over 0.6m depth of water (in summer) Inside the enclosure are 15 circular or linear rounded mounds, three of which are large enough (over 4m in diameter) to be the remains of cells. The smaller turf, or heather-covered, mounds may be the remains of ‘stack- steeds’ on which cut peat or turf would be stored, or they might be the graves of the lepers. Only excavation would provide a date for these structures, and enable some hypotheses to be made about the possible antiquity of the whole remarkable site. The recent intense archaeological focus on Papa Stour has resulted in some positive and some negative discoveries. The finds on Brei Holm are of the right date for early Christian activity, but undiagnostic as to whether this was a secular or ecclesiastical settlement. The investigation of the ‘ald kirk’ at Sneeans which producd no evidence of any building or burial activity strongly discounts the oral tradition of a chapel site in this location. This increases the likelihood that any early Christian chapel site is underneath or near the present church, at the head of Kirk Sand. This would follow the already established pattern of the medieval church being located on the same site as an early Christian one, as known from St. Ninian’s Isle in Shetland (ref. 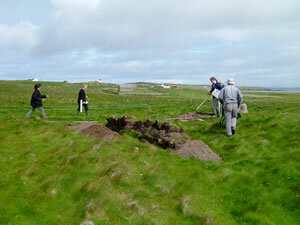 ), and appearing likely in the case of St. Nicholas’ Church on Papa Stronsay in Orkney (see Site O1.1). The survey of the leper colony on Hill of Feelie provides some detailed information about the nature of this site which could be taken much further. Ordnance Survey, 1878 (1880-2). First edition. 1:10,560. Sheets XXXIV, XXXV, XL and XLI. Ordnance Survey, 1880 (1881). First edition. 1:2,500. Sheet XXXV.13. Ordnance Survey, 1900 (1901). Second edition. 1:2,500. Sheet XXXV.13. Ordnance Survey, 1973. 1:10000. Sheets HU15NE, HU16SW and HU16SE. 38Unless an early chapel site was now so far below ground surface and buried in blown sand to a depth which the resistivity survey and test boring could not reach. 40Could this have been a corner-post from a Pictish four-posted shrine? The dimensions given by Low, if accurate (8’ in length and 2’ in diameter) render it very unlikely.